Rename digital photos quickly and easily. Give your digital photos meaningful names. Renaming is as simple as typing the new name and hitting enter. No right clicking or navigating through menus is required. Picnam uses as much of the window as possible to show the picture. Click on the picture to enlarge it to full size and zoom in on small details. You can tag pictures as you go through the list then move, copy, delete or rename them as a group. The bulk rename function allows you to rename a group of pictures using patterns including parts of the old name, incrementing numbers and a counter. Bulk rename also includes a function to add leading zeros in filenames which have had sequence numbers added, for example "Picture (2)" so that they will sort correctly in all programs. Add comments to photos which are stored in text files with the photos. Using text files means they are easy to find and readable by anyone without special software. Picnam is also useful for viewing photos. The Enter key advances from one picture to the next, and at the end of the folder Picnam can advance to the next folder automatically, making it easy to browse a collection of photos that span multiple folders. 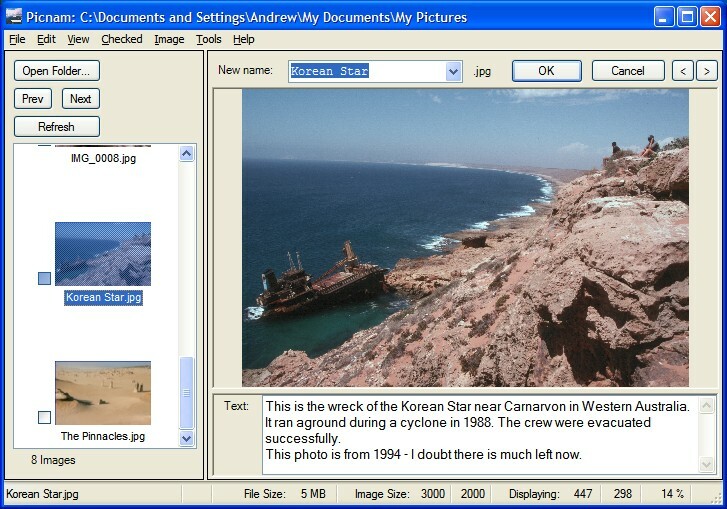 A free viewer is also available so that people can view photos with the text file contents displayed with the photo.